Number Built : The Air Force accepted a grand total of 820 C-135s type aircraft. The breakdown is as follows: 732 KC-135As, 30 C-135As, 15 C-135Bs, 4 RC-135As, 17 KC-135Bs, 10 RC-135Bs, and 12 C-135Fs for the French Air Force. EC-135s Worldwide Airborne Command Post Sy stem (WWABNCP) variants, in 10 different configurations varying by communications equipment fitted; 39 aircraft representing 7 versions made up the EC-135 family. 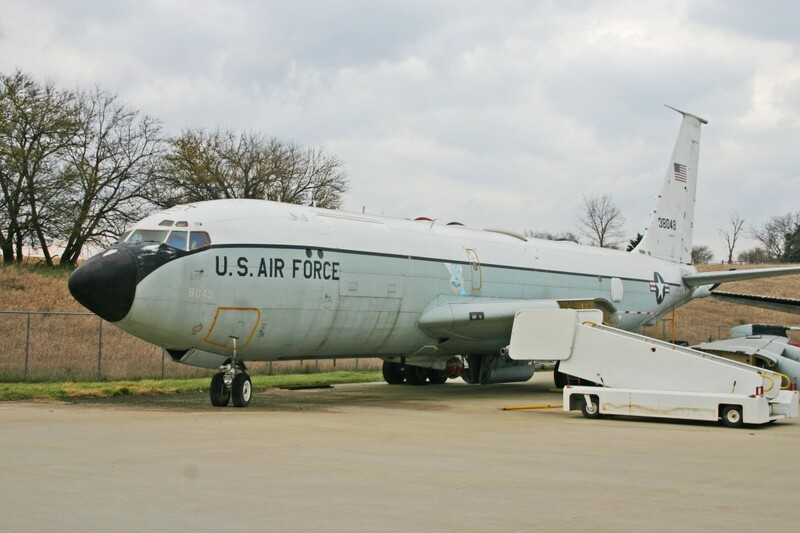 Also some KC-135As were converted to RC-135s aircraft such as RC-135Ds, and RC-135T. C-135Bs were converted into RC-135Es, RC-135Ss and RC-135Ms which were later converted to RC-135Ws. Powerplant: Four Pratt & Whitney J57 turbojet engines, 13,750 lbs. of thrust each, or four Pratt & Whitney TF33 turbofan engines, 18,000 lbs. thrust each. Weight: Empty 98,600 lbs., Loaded 187,466 lbs., Maximum takeoff weight 322,500 lbs. Dimensions: Wingspan 130’10″, Length 134’6″, Height 38’4″. Performance: Maximum speed 585 MPH, Cruising speed 530 MPH, Service Ceiling 36,900′. The Boeing EC-135 Looking Glass aircraft is a conversion of the basic C-135/KC-135 family of aircraft for the strategic command and control mission. This airborne command post function provides a survivable means of command and control in the event that SAC underground command center, alternate command posts, or ground-based communications are lost. It also provides an alternate method to launch the Minuteman/Peacekeeper missiles if ground launch control centers are destroyed. Each airborne command post aircraft carries a battle staff and variety of communications equipment. The SAC Airborne Command Post was on airborne alert around the clock from February 3, 1961 until July 24, 1990. When airborne, the battle staff, headed by a SAC general officer, monitors several communications systems and maintains contact with the SAC underground and alternate command posts, the national Military Command Centers, and the SAC alert forces. March 2, 1993- Dropped from inventory by transfer to the Strategic Air & Space Museum.